Can a 2011 iMac meet your needs? The 2011 iMacs are a popular choice for those looking for a used iMac with all the trimmings.2011 saw a lot of improvements to the iMac, while still retaining a high degree of expandability making them a good candidate for customization. Later years saw some options such as user-installable RAM go by the wayside in the name of cost reductions. It was also the last year for the CD/DVD drive which was removed to allow the slim design introduced with the 2012 models. If your interested in picking up a used 2011 iMac, read on to discover the ins and outs of the 2011 iMac models. The 2011 iMacs have undergone yet another evolutionary change. This time, the iMacs are outfitted with either Quad-Core Intel i5 processors or Quad-Core Intel i7 processors. Even better, the 2011 processors are based on the second generation Core-i platform, usually referred to by its code name, Sandy Bridge. 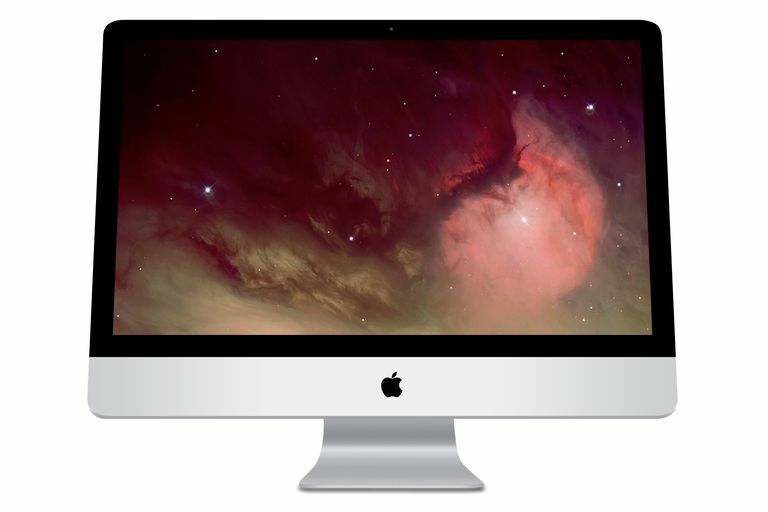 The iMacs also received updated graphics from AMD, and the Thunderbolt port, which brings extremely high-speed connectivity to the iMac. While the 2011 iMacs are by far the best iMacs Apple has produced, it's important to remember that any all-in-one desktop computer requires a few tradeoffs. So, let's take a closer look and see if a 2011 iMac will meet your needs. The iMac's design limits the type of upgrades an owner can perform, at least after purchase. That's not necessarily a bad thing; the compact design has most of the features a vast majority of desktop Mac users will ever need. The iMac is a great fit for those who spend their time working with applications, and don't want to waste energy trying to tweak hardware to bend to their will. This is an important distinction, particularly if you enjoy fiddling with hardware more than you realize. But if you just want to get the work done (and have a little fun), the iMac can deliver. The one place where the iMac shines at user expandability is with RAM. The 2011 iMacs offer four SO-DIMM memory slots, two of which are populated with 2 GB RAM modules in the default configuration. You can easily add two more memory modules, without having to discard the installed RAM. Apple claims the 2011 iMac supports at least 8 GB of RAM, and the 27-inch model configured with the i7 processor supports up to 16 GB of RAM. In actuality, testing performed by third-party RAM vendors shows that all models support up to 16 GB, and the i7 up to 32 GB. The disparity is caused by the fact that Apple was limited to testing the 2011 iMac with 4 GB RAM modules, the largest size commonly available at the time. Eight GB modules are now available in the SO-DIMM configuration. You can take advantage of the ability to expand RAM by buying an iMac that has the minimum RAM configuration, and adding your own RAM modules. RAM purchased from third parties tends to be less expensive than RAM purchased from Apple, and for the most part, is equal in quality. The iMac's internal storage isn't user-upgradeable, so you must make a choice about storage size up front. Both the 21.5-inch and the 27-inch iMac offer various hard drive and SSD (Solid State Drive) options. Depending on the model, available options include hard drives of 500 GB, 1 TB, or 2 TB in size. You can also choose to replace the hard drive with a 256 GB SSD, or configure your iMac to have both an internal hard drive and the 256 GB SSD. Remember: You won't be able to easily change the internal hard drive later, so pick the largest size you can comfortably afford. When it comes to the iMac's display, is bigger always better? For many of us, the answer is yes, yes, yes. The 27-inch iMac's display is simply wonderful to work with, but, boy, does it take up a lot of desktop real estate. If you want to preserve space, the 21.5-inch iMac has got you covered. Both iMac displays perform well, using IPS LCD panels with LED backlighting. This combination provides a wide viewing angle, a large contrast range, and very good color fidelity. The only possible downside to the iMac's display is that it's only offered in a glossy configuration; no matte display option is available. The glossy display produces deeper blacks and more vibrant colors, but glare can be an issue. Apple outfitted the 2011 iMacs with graphics processors from AMD. The 21.5-inch iMac uses either the AMD HD 6750M or the AMD HD 6770M; both include 512 MB of dedicated graphics RAM. The 27-inch iMac offers either the AMD HD 6770M or the AMD HD 6970M, with 1 GB of graphics RAM. If you choose the 27-inch iMac with the i7 processor, the graphics RAM can be configured with 2 GB. The 6750M used in the baseline 21.5-inch iMac is an excellent performer, easily beating out the performance of last year's 4670 processor. The 6770 provides even better graphics performance, and will probably be the most popular graphics processor in 2011 iMacs. It's a great all-around performer, and should easily meet the needs of graphics professionals, as well as those who enjoy a few games now and then. If you want to push graphics performance to the extreme, you should consider the 6970. The 2011 iMacs all use Quad-Core Intel i5 or i7 processors based on the Sandy Bridge design. Gone are the i3-based processors used in the previous generation. The 21.5-inch iMacs are offered with a 2.5 GHz or 2.7 GHz i5 processor; a 2.8 GHz i7 is available as a build-to-order option. The 27-inch iMac is available with a 2.7 GHz or a 3.1 GHz i5 processor, with a 3.4 GHz i7 available on the build-to-order model. All of the processors support Turbo Boost, which increases the processor speed when a single core is being used. The i7 models also offer Hyper-Threading, the ability to run two threads on a single core. This can make the i7 look like an 8-core processor to your Mac's software. You won't see 8-core performance, however; instead, something between 5 and 6 cores is more realistic in real-world performance. The 2011 iMacs all have a Thunderbolt I/O. Thunderbolt is an interface standard for connecting peripherals to the iMac. Its biggest benefit is speed; it outperforms USB 2 by 20x and can be used for data connections and video, at the same time. The Thunderbolt port on the iMac can be used not only as an external display connection but also as a data peripheral connection port. At the moment, there are only a few devices available, mostly multi-drive RAID external enclosures, but the Thunderbolt-equipped peripheral market should see a big boost during the summer of 2011. What Is Thunderbolt High Speed I/O? OS X Snow Leopard (original pre-installed system). macOS Mojave, released in 2018 marks the end of operating system support for the 2011 iMacs. Apple considers the 2011 iMac a vintage product in the United States and Turkey, and obsolete in the rest of the world. Vintage products are not eligible for hardware-based services, though other types of support may be available. Obsolete products no longer are eligible for any type of hardware repair or support. Certain countries or states may have consumer protection laws that extend the support timeframe for the 2011 iMac. The expected lifetime of the 2011 iMac has more to do with the software you need to run, then the underlying hardware. Most vintage Macs are put out to pasture, not because of a failure, but because a needed app is not able to run on an older operating system. Before purchasing a 2011 iMac, make sure any apps you need will run on one of the supported Mac operating systems listed above.